As the year draws to an end, requalifying for elite status can be a desperate, mad dash to hit those qualification thresholds, and while there are plenty of other options besides just trying to fly a lot more before the end of the year, American Airlines added another level of stress for their frequent flyers by discontinuing their “soft landing” policy earlier this year where they’d only drop elites one level if they didn’t requalify for their current status. However, American Airlines announced today, November 8, 2013, that they are giving two new options for frequent flyers to requalify for status if they fall short of the miles that they need this year. American Airlines made an announcement today regarding changes to acquiring elite status. From January 2014 through May 31, 2014, American elites will have two options. Boost: If you end the year close to AAdvantage Executive Platinum, Platinum, or Gold status but don’t quite make it, you can boost to the next level. Renew: If you are an elite status member in 2013 but aren’t able to retain your status by the end of the year, you are eligible for a status renewal. American Airlines is now allowing you to boost to the next status level. If you are within 5,000 miles or 5 segments short of reaching Gold status, you can boost to the status for the cost of $399. If you are you already Gold and are way off from retaining it and out of the “boost” range, you can buy it back for $649. Gold normally requires 25,000 miles or 30 segments. If you are up to 10,000 miles or 10 segments short of achieving Platinum, you can boost to the status for the cost of $899. If you are within 5,000 miles or 5 segments short of achieving Platinum, you can boost for $699. If you are you already Platinum and are way off from retaining it and out of “boost” range, you can buy it back for $1,199. Platinum normally requires 50,000 miles or 60 segments. If you are up to 10,000 miles or 10 segments short of achieving Executive Platinum, you can boost to the status for the cost of $1,799. If you are within 5,000 miles or 5 segments short of achieving Platinum, you can boost for $1,199. Unfortunately there is not a renewal option for Executive Platinum, which usually requires 100,000 miles or 100 segments. 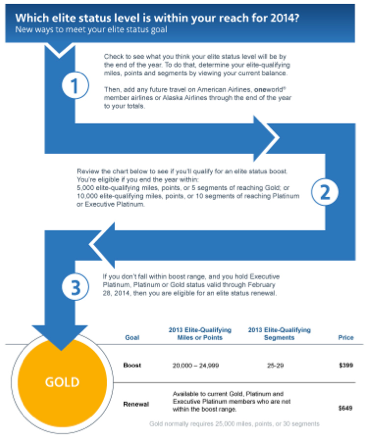 Reaching American Airlines’ Platinum and Executive Platinum obviously costs more. These options are a little like Delta’s usual end-of-year sale of MQM’s ranging from $395 for 2,500 to $995 for 10,000 MQM’s, as well as US Airways’ giving flyers the opportunity to basically just purchase elite status outright ranging from $249-$3,999 depending on the level and your amount of elite-qualifying activity. So while this is not what I’d call groundbreaking, I do think it’s nice that American is at least giving flyers more options to qualify for or renew their status. Especially when both United and Delta have recently devalued their award charts and added a spending qualification requirement that goes into effect in 2014, and there’s no telling what other customer-unfriendly moves are coming down the pike. There is nothing worse than getting to year’s end and realizing that you are going to lose that highly-sought after elite status that you worked so hard for, or are just missing moving up to the next level. We’ve all heard of (or lived it ourselves) miles junkies going on extreme mileage runs before the clock hits midnight on New Year’s Eve to catapult their balance to the next level. So could American’s new move alleviate some of that end-of-year stress? And is it worth paying to reach that next level or avoid falling down the ranks? As an Executive Platinum, I love my elite status thanks to the mileage bonuses, extremely useful Systemwide Upgrades, and unique perks like Elite Rewards. While I plan to boost my elite mileage by spending on my Citi AAdvantage Executive World Elite Mastercard ,which gives cardholders 10,000 elite qualifying miles when they reach $40,000 in purchases each calendar year, it’s nice for non-cardholders to have some more options as well. The AA Elite Benefits Chart. Access to the Gold Service Desk reservation line at 1-800-848.4653. Priority access check-in, security screening lands and boarding to avoid lines. In airports where there is not Business check-in, you can use the First Class check-in. Access to preferred seats (aisle and window) for you and up to 8 companions, or Main Cabin Extra now through December 31, 2013. For more on American Airlines seating in the new A319 Airbus, click here. 25% bonus on base miles for eligible flights. Minimum of 500 AAdvantage miles per flight segment on applicable routes. AAdvantage award charge fees waived when using miles from your AAdvantage account. Check two bags free of charge (for you and your companions). Discount for Admirals Club membership (for complimentary snacks, drinks and WiFi). As a gold member with AA, you will have Ruby status for oneworld partners and earn priority check-in and preferred seating when traveling with one of the member airlines. You will also get priority check-in and boarding when traveling on Alaska Airlines, along with two checked bags free of charge. Platinum members get all of the above with the added enhancements of an upgrade window of 72 hours before departure (though you have to request upgrades using your 500-mile upgrades), free checked bag, priority access check-in and security, and priority baggage delivery. Platinum members also earn four 500-mile upgrades for every 10,000 miles flown. 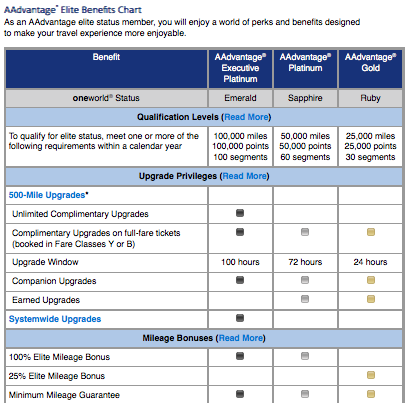 Platinums also get a 100% elite mileage bonus. Meanwhile, perks for Executive Platinum include unlimited complimentary upgrades starting at 100 hours before departure, companion upgrades, priority access check-in, security, free checked bag, and priority baggage delivery. Executive Platinum members also get 8 one-way systemwide upgrades yearly and they can be used to secure the upgrade in advance. These upgrades are good for any paid fare class on any AA flight, so generally they are best used for international flights, though they do come in handy when you don’t want to fork out the extra thousands for transcontinental business class and want to confirm the seat- especially for red-eye flights. 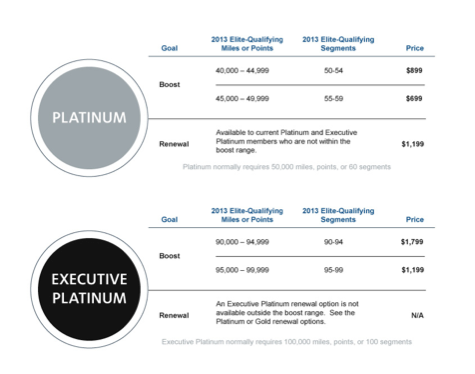 Executive Platinums also get a 100% elite mileage bonus. So whether this is worth it will really depend on your elite level. If you’re a Gold member, paying $349 to requalify might be worth it if you maximize perks like free checked bags, choosing Preferred seating, and taking advantage of benefits like Priority AAccess. In my personal consideration, I would think about paying $1,199-$1,799 for Executive Platinum again if I were really going to fall short because I leverage those Systemwide Upgrades for thousands of dollars worth of value each, such as when I used one to upgrade a purchased economy ticket from Sao Paulo to New York, and was able to upgrade to American’s new 777-300ER business class. Before deciding for yourself, though, I’d suggest sitting down and really crunching the numbers to make sure it makes sense for you. And last year’s series on elite status requailfication: Last-Minute Elite Status Qualification Ideas for American Flyers, Last-Minute MQM Ideas for Delta Medallion Qualification, Last-Minute United Premier Status Qualification Ideas, Last-Minute US Airways Preferred Status Qualification Ideas, Last-Minute Virgin America Elevate Elite Status Qualification Ideas.